The kids had their first windsurfing lesson today. Hubby was is a big windsurfer. Growing up in San Francisco, he learned the hard way: in the shark-infested, hypothermic, tempestuous waters of the San Francisco Bay (that's how he likes to tell it). 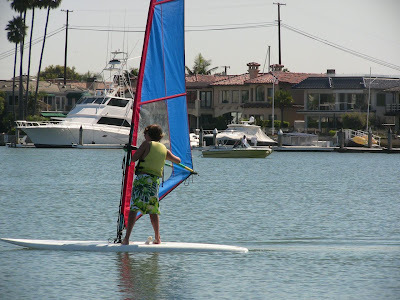 We thought we'd let the kids have an easier time of it by taking a long, leash-held, private lesson in the warm, local harbor waters of Southern California. The instructor was very good. I've attempted many windsurfing lessons in the past and hadn't heard half the little tidbits of wisdom he so casually dispensed. Now my son and daughter just need a little more practice to be ready for some serious sailing in Andalusia next summer. I've been reading up on where to go. The hottest windsurfing in Spain (not including the Canary Islands) is known to be in Tarifa, on the very southernmost tip of Spain facing Morocco. Winds here can reach 40 knots and the area is not recommended for beginners, so maybe we'll just let Daddy spend a few hours in Tarifa on his own. I'm thinking the oceans might be a little calmer (perhaps with resorts that serve tropical drinks!) on the Costa del Sol or on the Atlantic side near, say, Cádiz. Doing some earnest research now on these resorts winds. 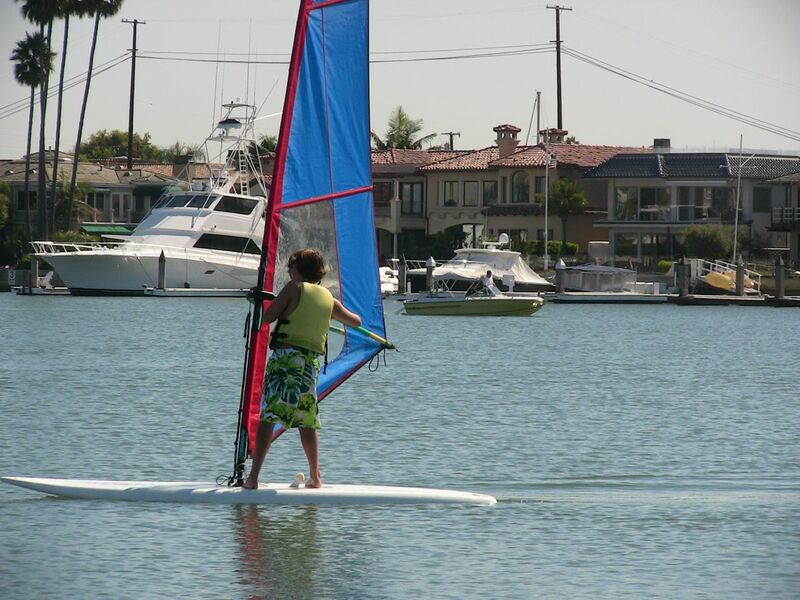 Son's first windsurfing lesson today. Have I mentioned another stroke of good fortune regarding our trip to Spain next summer? 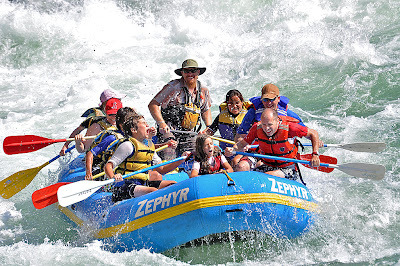 A few weeks ago our family went whitewater river rafting. We were on an 8-man raft, and the other occupants of the boat were a family of four from Barcelona. Naturally, under such intense, high-adventure bonding circumstances (read: laughing a lot together) we got to know each other quite well, and it turns out, this family owns an apartment on the coast of Spain near the Portuguese border that they'd be happy to let out to us! We exchanged email addresses and are going to keep in touch. How about that!? Rafting with our new Spanish compadres. Follow up post: read about the success of our family windsurfing in Tarifa, Spain, in the summer of 2012 here. Wow that's awesome to meet people like that! Windsurfing lessons. Whitewater rafting. A vacation house to lease. Sounds like you guys are good to go! I also suggest that you try white water rafting if you want to try other water sports. I've never tried windsurfing because I'm scared I might fall on the water without much support. Although I wanna try it, I think I would prefer riding on hand built wood yachts and go for island hopping instead. This looks cool. I might be adding wind surfing to my list of adventure sports to try out. Spain is a amazing country or there are various beaches where you can go or spend your whole day with doing so much adventures activity..I also love to do banana rafting or windsurfing...These are my most two favorite activities that i ever do....! !